The Mapuche are a group of indigenous inhabitants of Southern Chile and Argentina, including Patagonia. When the Spanish arrived in the 18th century, they lived in fertile valleys as hunter gatherers, maintaining a culture which is said to have prevailed since 500 BC. Despite their rich culture having been looked down upon for the last 3 centuries, the Mapuche culture is now becoming more and more fashionable in the Chilean capital and abroad. The Mapuche, a name that means “people of the land” in their original language, resisted invaders for centuries – first the mighty Incan empire, then the Spanish conquistadors who arrived five centuries ago in the area now known as Chile. The Mapuche ultimately won treaties with the Chilean state recognizing their right to everything south of the Bio Bio river, or roughly the entire southern half of the long, thin country. But in the late 19th century, a new wave of European settlers arrived, and the treaties were broken, with Mapuche lands seized in violent takeovers. The survivors were pushed to the fringes of settled lands. Today, most of the more than 1 million Mapuche live in Santiago’s metropolitan area and in their ancestral home in south-central Araucania, the country’s poorest region. Now, young Mapuche are starting to become curious about exploring their roots again, and no longer deny their origins the way their ancestors did to avoid discrimination. In a government health program, officials have worked hard to incorporate pre-Hispanic knowledge, by making consultations with Mapuche shamans a part of general health practition; And you’ll find Mapuche influence on the menu at the famous Borago restaurant in Santiago, which employs traditional cooking methods, such as cooking in the ground and using native ingredients sacred to the indigenous group. “Not thinking about that, just having the hope that we will never miss but if ever that happens, there will be no need to worry as the next day it will be more crowded“. Cabezas then puts this mode of thinking opposite our western throw-away culture of ‘disposable consumerism’, in which we gain pleasure from materialistic and superficial acquirements, calling them a part of general welfare and wellbeing and causing us to believe that we will be happy when we get a new car, the latest electronic equipment or are more successful than others. Lifted from this desire and burden, the Mapuche focus on sharing, not from a role but from the person who seeks to transcend from their own culture and from others. More so, a research published in the Journal of Ethnobiology and Ethnomedicine shows how adaptive the Mapuche knowlegde of ecosystems has been and still continues to be. Written in 2016, the article tells about their responses to a local decline in freshwater systems and the changing presence of sweet water fish in Patagonia. Due to their convictions that the whole body of water -including its fishes- is a living spiritual being, they treat it with the utmost respect, relying on ancient knowledge for their fishing techniques and even recognition of which species to eat and which not to eat. The research further explained that the introduction of new species by the 20th century had completely changed their diet to one which doesn’t involve fish, simply because of this reliance on ancient knowledge. This signifies how important it is to Mapuche, to maintain a culture of respect as a management plan of regional natural resources. However, their adaptive knowledge of local ecosystems has enabled them to introduce other nutrients into their diet and keep them thriving. Last but not least, the traditional Mapuche forms of education have been referred to as ‘making real contributions to the formation process for the children of our country.’ in a paper by the university of Temuco, Chile. Traditional Mapuche education is completely rooted in the family and community routine. The concepts of building knowledge or “to learn by doing” takes form in labor, social, cultural and productive actions, in which the teaching vs. learning process involves different family members. 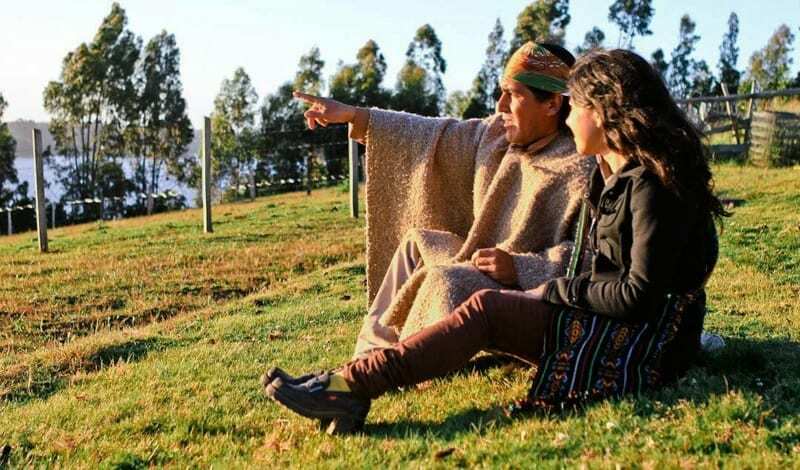 The Mapuche family has basic teaching and evaluation patterns, which acquires certain levels according to the characteristics and special needs of each family or community member depending on their social, cultural or productive level. Therefore, the family in question plays an active role in the education of their children. This role is shown in the responsibility assigned to the family in the education process; but not only with children of the closer family group, it is also extenced to all children of the community. Consequently, the responsibility in the education-learning process goed beyong their own children, having to act co-supportively in the formation process of relatives and community neighbors. Thus, communication is the essential tool in the formative process and as the educational level becomes more complex other family groups are incorporated as part of this communication with common sense. Want to read more about the thriving Mapuche culture in Chile? Go here.